Do you wanna wear something special on your hands? 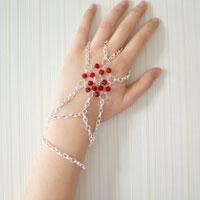 Today I generate a new jewelry craft idea – make a silver hand chain bracelet with beads decorated. Go ahead and follow me to see how. Wonder how to make a brief chain bracelet? In this tutorial, I will show you the detailed steps on making a golden chain wrapped bracelet!